Your treadmill workouts can be some of the most efficient, challenging, calorie-burning routines around. You just need to know how to set them up the right way! Bored with the treadmill? Not seeing the results you want? It’s time to super-charge your treadmill time. Here are five treadmill workouts designed by Cindy Wasilewski, fitness manager at The Lodge at Woodloch, a destination spa in Hawley, Pa., and Jeff Baird, fitness director of Atlanta’s Blast900 gym. You’ll get a great workout in 20, 30, or 60 minutes. Keep an eye on your heart rate to make sure you’re getting the most out of your workout, but not pushing too hard. First, calculate your maximum heart rate, which is 220 minus your age. If you’re a beginner, shoot for 50% to 65% of your maximum heart rate; 60% to 75% for intermediate level; and 70% to 85% for experienced exercisers. Adjust the following treadmill workouts as necessary to keep your heart rate in these ranges. Besides a very good treadmill, you’ll need hand weights and a stability ball for the floor exercises. As always, check with your doctor before you start a new exercise program. 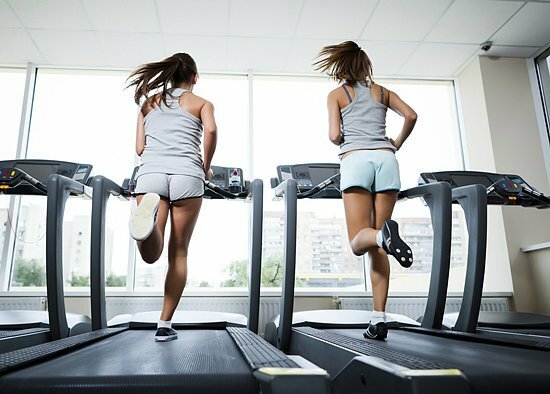 If you’ve got an hour, here are two different treadmill workouts to try. The first workout is called “No Excuses” routine because it delivers maximum results for the time investment. The second workout is an interval trek, designed to boost cardiovascular endurance. The perceived exertion rate referenced in these workouts is a scale of 0-10 used to measure the intensity of exercise. For example, 0 (nothing at all) is how you feel when at rest, while 10 (very, very heavy) is how you feel after extremely strenuous exercise. Do one set of 30 overhead shoulder presses with dumbbells while alternating squats. Do one set of 30 bicep curls with dumbbells while alternating lunges. Do one set of 30 chest presses with hand weights on a stability ball (hips in air). Do set of 30 reverse flies with hand weights on a stability ball (hips in air). Stretch.